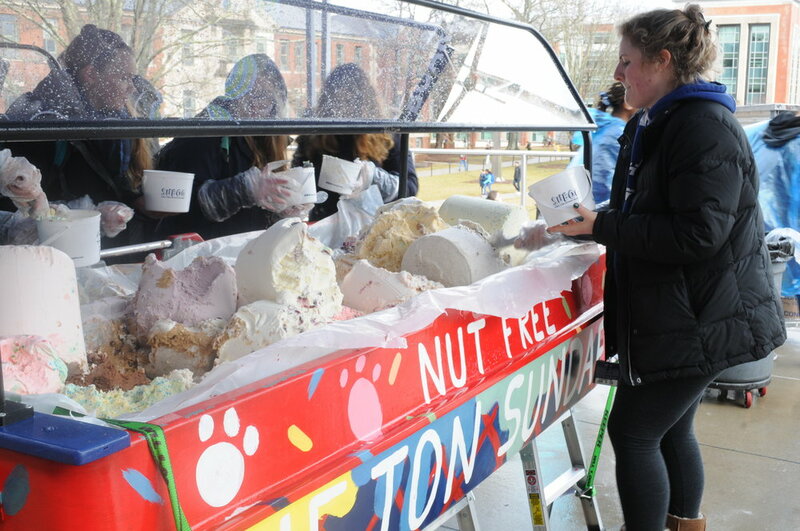 On Friday, as students took part in one of the oldest University of Connecticut traditions, One Ton Sundae, they were greeted by several changes in the running of the event. In addition to increasing the scale of the event this year, the price was waived for all students. Winter Weekend has been hosted by the Student Union Board of Governors for the past 40 years, and almost synonymous with the weekend itself is its most notable event: One Ton Sundae. Every year SUBOG acquires a literal ton of ice cream from the Dairy Bar, and fills a large boat with a variety of flavors, including the newly announced Senior Scoop (Peanut Pretzel Paw Prints this year). Students queue up hours in advance to be given a bucket, and access to the mound of ice cream. After filling their bucket with as much ice cream as they want, students can proceed to add a variety of toppings. In the past there was only one boat of ice cream, but this year the number of boats, and the total amount of ice cream, was doubled. “We’re increasing the quantity to meet the demand, and to help with the flow,” SUBOG Major Weekends Chairman and sixth-semester biology major Rob Lepore said. Although both boats had a wealth of flavors, one was designated as “nut-free” to make the event more accessible to all students, according to Lepore. As a second change, SUBOG no longer charges students a dollar for the bucket, as they have in the past. Again, this helped the event run more smoothly and the line move quicker. In the long run, a single dollar per person didn’t add much to the SUBOG budget, according to Lepore. The only thing students had to spend on the event this year was the time they waited in line. Even with these changes, students still had idea for improvements SUBOG could make. The students who reached the line first arrived at 8:30 a.m. for the 11 a.m. event. Although the weather was relatively warm for winter, reaching about 50 degrees, the morning started with rain, so the Student Union terrace was crowded with umbrellas. By the time the event was set to begin, the line stretched all the way from the Student Union Terrace, down the steps and past the bus stop in front of the Castleman building. Even with two boats of ice cream and a quicker-moving line, students still had a long wait, which they spent chatting with friends and making trips back and forth to the free hot chocolate station. Given that you can get as much ice cream as you want in a dining hall, a large part of the event is just the experience. Pittsley said part of the reason she showed up was because, as a senior, she might as well do it one more time. For others, once is enough. For other students, the changes made this year are enough to keep them coming back. Alex Houdeshell is the associate managing editor for The Daily Campus. She can be reached via email at alexandra.houdeshell@uconn.edu.